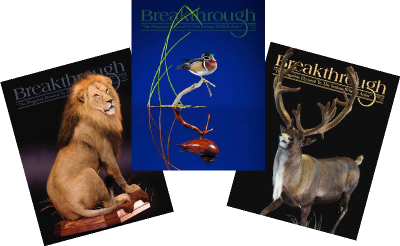 Since it began in 1982, Breakthrough magazine has been one of the foremost sources of information, articles and inspiration for wildlife artists and taxidermists. We keep stocks of recent issues which can be ordered below or we can order any one of the over 100 back issues. Issued every three months, we can also manage a subscription for you, sending out the latest issue as it arrives. Its the best way to keep up to date with new developments and trends.